workers that are misplaced. These apartments become run down due to shoddy material and building practices, are sometimes dangerous places to reside, and are often packed to the brim with more people than is appropriate. 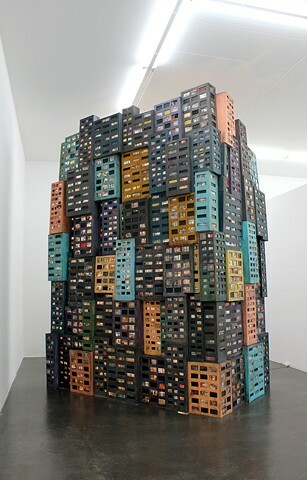 This work is a 3.5 meter tall, 3 meter wide wall of small ­scale apartment buildings, butted up against one another to form a colossal shape of an over sized building. The buildings are attached together and appear as an overwhelming wall of concrete, plaster, windows, and dirty yet vibrant facades. Small lights, images, and video show through the dingy, curtained windows.The massive number of buildings alludes to the issues of overpopulation, crowding, and poverty in large cities across the world.